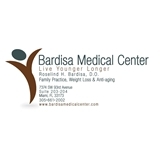 Bardisa Medical Center (Miami) - Book Appointment Online! My visit went well, I got my referrals, but this is my 2nd visit to this new Primary Doctor, and I have yet to meet the doctor. Feels kind of strange.